I’ve been thinking for a very, very long time about writing this post. Years, actually. Part of it has been the courage of Jenny Lawson, The Bloggess, that’s allowed me to even think about doing it, part of it has been the necessity of living a life that is so controlled by this somewhat hidden part of myself, and part of it is that I feel more and more like I’m lying by not being open. Truthfully, there’s still a huge stigma. I have lost at least one job because of it. I have family who flatly refused to believe me when I told them. Interestingly, it was an email I received from a friend at Harvard yesterday that made me realize that not only did I want to spread the word about the contents of her email, it was the perfect venue through which I could finally open up and come out of the mental illness closet. My name is Kelly Hopkins and I am mentally ill. I have Major Depression, Generalized Anxiety Disorder, and PTSD. This might be the point when most people run screaming for the exit or unfollow this blog. If you do, I’m sorry for you. Before you go, please check out the project that I received the email about that prompted me to finally write this post. Hi guys, so I’m working with a friend who lives in Phoenix and is putting together an exhibition called “In Their Shoes” for a nonprofit called Attitudes In Reverse, which is directed at helping middle-high school aged kids be more aware and open about mental illness, depression, self-harm. 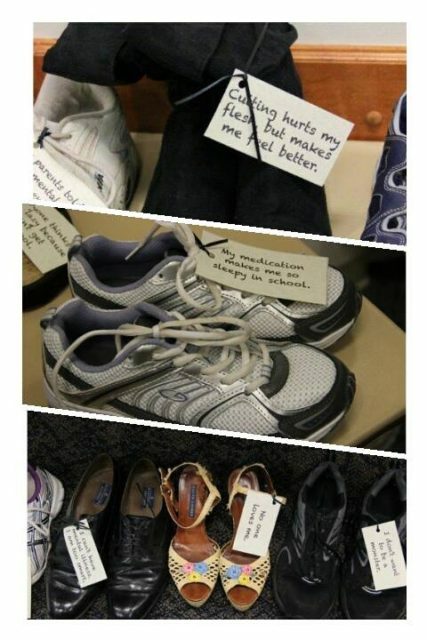 So what I am doing is collecting used shoes from folks to be displayed to represent the number of children and young adults who have are fighting, have beaten or have lost their battle with mental illness during a convention. They need about 400 pairs of shoes, I’m trying to get about 20 pairs to mail to her by the second week of March. If you have a pair you want to donate please let me know. I clicked through and I was struck by the visual of the empty shoes. (If you’ve been to the Holocaust Museum in DC you’ll know what I’m talking about.) I was reminded of how close I’ve come to being a pair of empty shoes just like these. And I realized then that even though there are so many things still wrong with my life, that it’s time for me to step out of the shadows and tell the world that I’m still here. That more than a decade back I made the decision to seek treatment and that I’ve been fighting every day since to silence the voices of recrimination, self doubt, and straight up hate that are part of my disease. That despite my disease telling me that I am on my own, that nobody loves me, that the world would be a better place without me, and that death would solve all my problems, the truth is a harder, messier answer. That I have to choose to face each day one day at a time, one problem at a time, and keep on going. I am lucky in many respects. I live in a city with 3 of the finest hospitals in the US. I benefit from white privilege, and even when I was between jobs I often had access to medical care or people who were willing to float me money to keep me on the meds that keep me, quite literally, from listening to the insidious disease that lies to me and tells me that I would be better off dead. I spent my entire childhood hearing that over and over again every day, “It would be so easy to end it all. Death is better than this.” Going back to that as an adult would kill me and it’s just dumb luck and the kindness of friends and strangers that the economic turmoil of the last ~8 years hasn’t landed me in a body bag. As of 2016 I have finally reached a point where I am in a stable job, a marriage to someone who understands, and have a solid enough group of friends who understand that I can finally come out and say this without fear that I will be fired for admitting that I suffer from a disease that is as organic and real as any other. The depression/anxiety/PTSD are as genuine and real as if I had a liver disorder or a broken arm. Nobody would skip treating those, just like nobody expects me not to treat my epilepsy. So I treat my mental health as if I had a broken leg or a stomach ulcer. I see my doctors, I take my medications, I ask questions, have blood tests, and check in with myself. I have good days and bad days just like with any chronic illness. The difference is that these diseases actively try to kill me and with my own hand. And they’re invisible. All of this brings me back to the link and photo above. Some of us lose our battle. 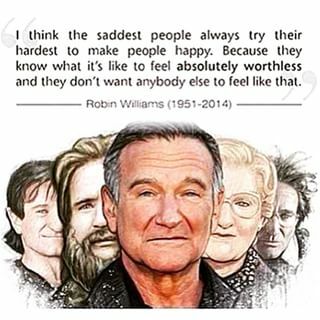 I know people who have and probably all of us remember Robin Williams. Not everyone has the support, the medication, the tools, or the ability to fight for their lives every single day. That’s why projects like AIR (Attitudes In Reverse) and people like Jenny Lawson are so important. The stigma is real, folks. The individuals who still think that people like me “just have to try harder, smile more, drink more tea, lose weight, etc” are legion. And they’re not a quiet crowd. They’re celebrities jumping on couches, they’re men of a certain age, and sometimes they’re doctors. All of this is to say one very important thing: Depression Lies. And I count myself lucky to work for a university that recognizes that mental health is a super important part of the whole picture for the entire community. Click here for the PDF that we display on the door of my office. Because we are stronger together and it’s easy to lose sight of that when depression is making it hard to see or feel. I’m going to bag up some shoes for my friend. They’re going to be mailed off to the display in Phoenix. If you’re inclined to do the same drop me a comment and I’ll see what I can do about getting you the info. The folks setting this up in Phoenix are doing it at a convention happening there and are fundraising to help cover the costs. If you want to help in their fundraising effort, click here. If you want someone to talk to, if you need help with how you’re feeling, or if you’re feeling suicidal or the urge to self harm, click here. Jenny Lawson has put together links for confidential help resources all over the world. Please remember that the world needs you. You may not be able to see it from where you are right at this moment, and you might need to trust some other people to tell you that right now, but it is true. Before you do something permanent, talk to someone. The link is here. The you of the future will thank the you of today. Every day is a little victory. Even the bad ones. Don’t forget that. I adore you. I’m so glad you’re here. Thank you so, so much. Your support means more than I can adequately express. Hi, I’m Kat and I am the person who your friend is collecting the shoes for. I am the head of the Phoenix AIR chapter. Thank you for telling your story, it will help so many others. Thank you for donating your shoes and sharing the links but above all, Always Keep Fighting. I may never meet you but you are important to me and the world. Hugs from AZ! I have had some “aha” moments lately, having had two people very close to me reveal their serious issues. I had a moment of clarity recently, while on a plane. I was stressed and anxious beyond anything I had ever felt in my life before. I was on the way across the country to a family member who had attempted suicide. I could not deal. At that moment on that plane, I remembered thinking I really didn’t care if it went down. I had never had a thought like that in my life. I realized how I take NOT having mental issues so for granted, and also realized that how I felt in that moment was how some people live much of their lives feeling. So even though it may not feel like it, I hope you all know that you are some brave mofos. Thank you for this, and I’m sorry to hear about your family member. I hope that they are doing better. As for bravery, for me at least it isn’t about bravery as much as it’s about this weird affinity my body and lizard brain have for life even when my disease tells me over and over again that it would be SO MUCH BETTER being dead. I think I lived this way for so long before I got it under control that I just didn’t know that we, as humans, aren’t supposed to think every single day about throwing ourselves in front of a train or slitting our wrists at the kitchen sink. Neuronormative human brains aren’t supposed to work that way and in people such as yourself, thoughts like that are shocking. To people like me, they’re constant. Thank you again, and my best to you, your family, and anyone you know who is fighting. It does get better and having people like you around helps more than you know.